We sat in the gazebo in the middle of forty beautiful acres with open books on our laps discussing chapter five of “Chasing God”. It was evening and the sun was slowly setting, the only sound was that of birds scurrying about and the breeze on the wind chimes. We sat in silence as the truth of Angie’s words filled the space between us. Just a few minutes earlier we were at dinner with about thirty Benedictine Sisters inside the hundred year old Monastery that sits in the middle of the property. At dinner Sister Kimberly was entertaining us with a hilarious story. She was at a retreat out of state when several of them decided to make their way down to the lake for a few minutes of quiet reflection. It turned out to be not so quiet after all. On the bank of the lake was a pair of geese with a large brood of goslings. Sister Kimberly was excited to see all of the baby geese, when suddenly a large dog came out of nowhere barking and chasing after them. The momma goose ushered all of the babies into the lake and then proceeded to stretch out her gigantic wings over each of the goslings and pushed them under the water. She stayed there like that for the longest time, hissing at that dog, and nearly drowning her babies. Sister Kimberly said she held them under water so long she was sure that none of them would survive. Eventually the dog wandered off and one by one the baby geese bobbed back up to the surface. I couldn’t help but think about her story as we sat in the gazebo discussing what it looks like to take refuge under His wings. How brave of that mother goose to gather and protect the little ones. How terrifying it must have been to be one of those babies; thrown into the lake, pushed under water, surrounded by darkness, gasping for breath. I imagine they might not have thought their mom brave or heroic or nurturing. I bet they fought against those strong wings under that cold water. Maybe this is why taking refuge is harder than talking about refuge. “I will take refuge in the shadow of Your wings until the disaster has passed” (Psalm 57:1) sounds a lot more poetic then “please nearly drown me and hide me in a dark cold place until the disaster has passed”. The truth is; experience is always messier than knowledge, which may be why we shy away from it. The next morning I got up early and went out to the pond. 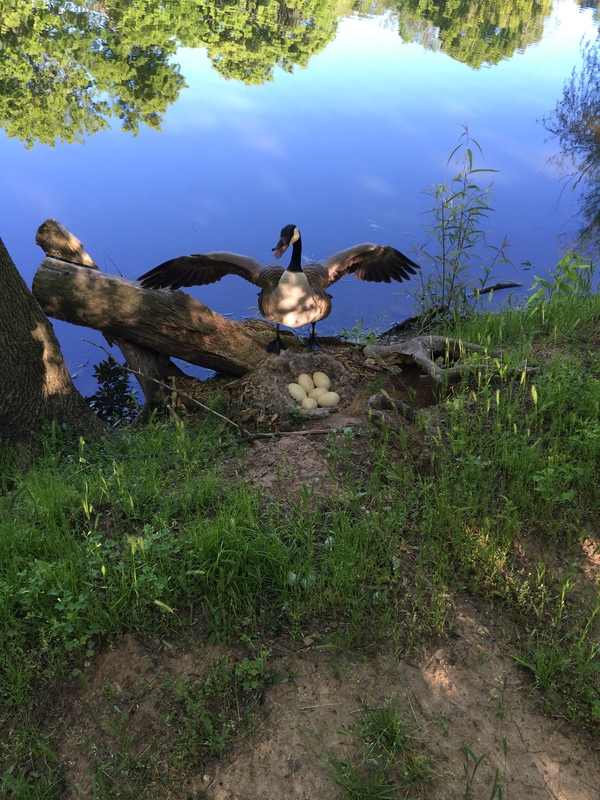 I found my own pair of geese; these two aren’t keeping an eye on a young brood, but on a nest full of eggs. Their diligence to watch those eggs amazed me. They were willing to take me on the moment I got to close to their precious babies. I understand their fierce protective nature, I am a mother, I would do the same. I even understand why the mother goose pushed her babies under the water. I didn’t make sense to them, but to her it was what needed to be done in that moment. So many times in my life I’ve felt like that nearly drowned gosling. I’ve fought against God, questioning what on earth He is doing to me. I’ve felt like the darkness would never lift, that the waters pressing in around me would never recede. Like Angie I’m a lot better at studying Him than trusting Him. Because often trusting Him doesn’t make sense, at least not from my perspective. Job said “though He slay me, yet I will hope in Him”. I love the way the New Living Translation reads: God might kill me, but I have no other hope. (Job 13:15) Sometimes God’s ways don’t make sense. Sometimes it feels like He doesn’t hear our desperate cries and will never come to our rescue, but what if He is rescuing us in a way that feels more like drowning than being snuggled up warm and dry in a safe nest? Can we trust Him in those moments? He says we can. He promises that His plans for us are for our good and not to harm us. Maybe trusting Him looks a lot more like a defenseless gosling trusting her mother’s wings will not drown her but protect her than believing that trust means we will never experience darkness or fear or pain under His wings of protection. We know that if one of those baby geese had stood her ground and faced that dog in her own strength she might have wound up as lunch that day. That would be a foolish thing to do, yet I do the same thing all the time. When faced with disaster my immediate response is often to either face it head on and try to figure out a way through in my own strength or to run and hide all alone wondering why Jesus isn’t rescuing me. What if instead of looking to ourselves for rescue we looked for His wings and then stayed put under them for however long it took? Yes, it might be scary under there, but it’s better than facing that dog alone.